My bike came with the commonly fitted Stage 1 performance kit: an EJK fuel controller, FMF Q4 pipe with MegaBomb header, drilled air box sides, spark screen removed from air filter element and a 13T sprocket. 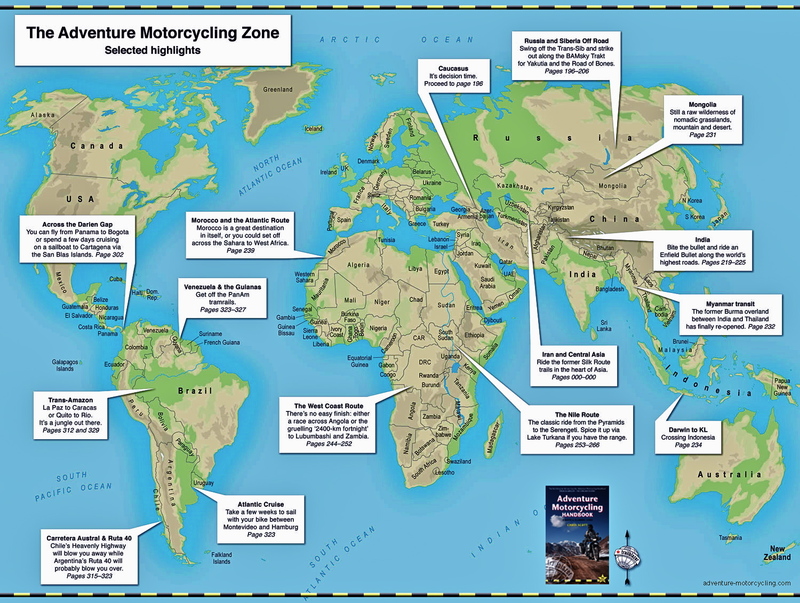 All probably great for recreational dirt biking; not so well suited to slow backroad touring where fuel economy and not breaking something is a priority. 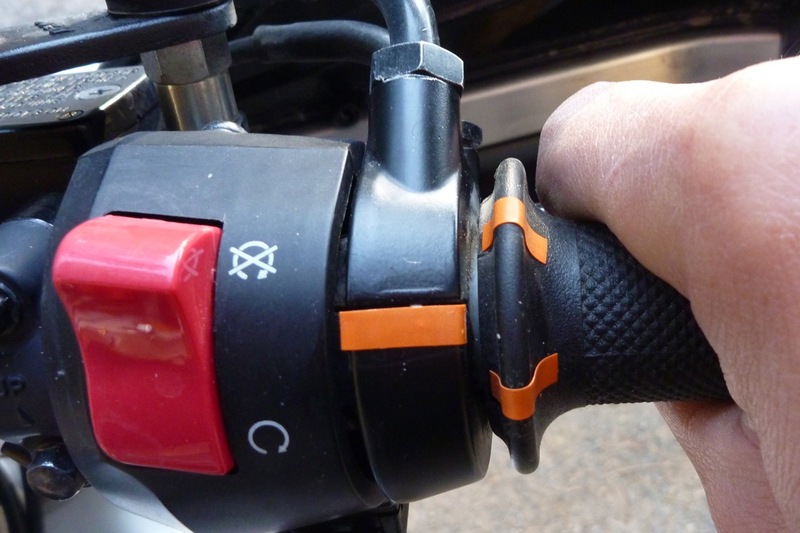 To help ensure the former I’d done my old trick of marking the throttle to see at a glance how open it is. In a headwind or on a gentle upgrade it’s possible to not realise you’re unnecessarily WFO, bogging the motor and possibly wasting fuel. Before I even rode the F-L I refitted the original 14T, and after a dirt ride in the hills I knew that FMF pipe had to go too, even after we tried quieting it. 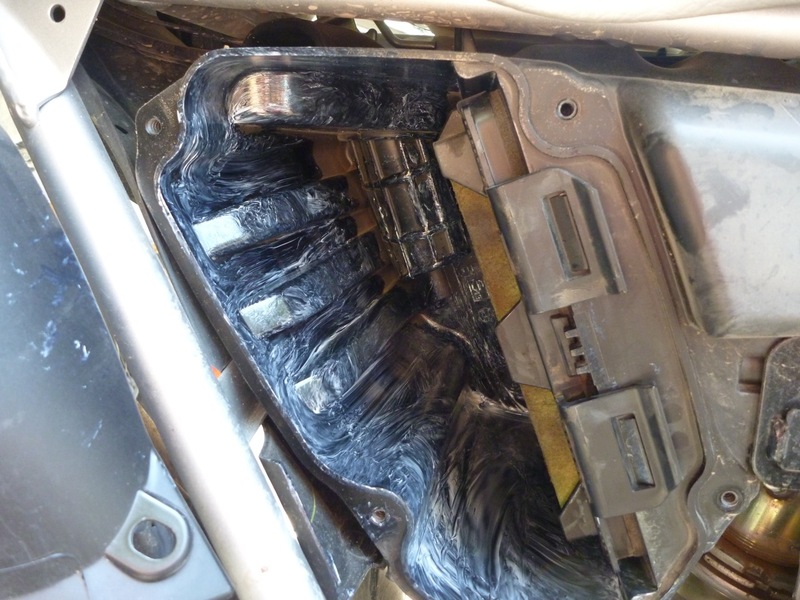 I was also not so keen on extra holes in the air box sides; that’s the last thing you do for long-range desert riding, though apart from sandstorms, it’s trailing others’ dust that is usually the problem. So when I left Phoenix I was on the original heavy but quiet pipe, the non-standard air box holes taped up but with the EKJ programmer unmodified (i.e. : still set at Stage 1 settings). I kind of hoped the ECU might deal with it, but realistically expected the bike to run rich now it was ‘choked up’ to near original specs. Heading into Nevada against strong winds, sudden increases in elevation, a full payload and little experience of what was normal, it was hard to tell how the bike was running but it didn’t feel fabulous. After a couple of days blown around at 55mph and with mpg as low as 42US (50UK) and even just 54US (65UK) while coasting 5000 feet down to Death Valley and dirt road plodding, I was ready to try something else. After Death Valley I pulled off the air box tape and immediately thought it ran better (certainly a nice induction throb was apparent). 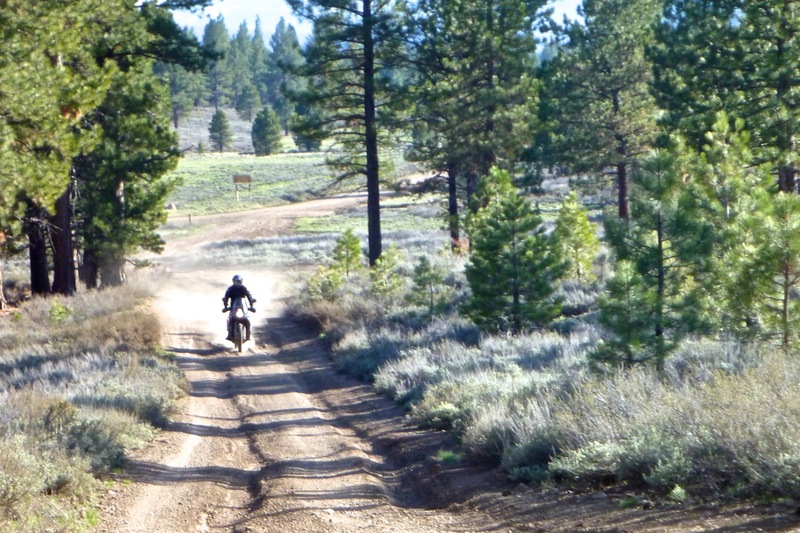 Sure enough, the bike climbed steadily along Highway 395 from 4000′ to nearly 8500′ in the Sierra Nevada after which I stayed at 7000′ most of that day at up to 65-70mph. The tank was now returning 58US or 70UK mpg, peaking at 73US/88UKmpg around Lake Tahoe. That was more like it. 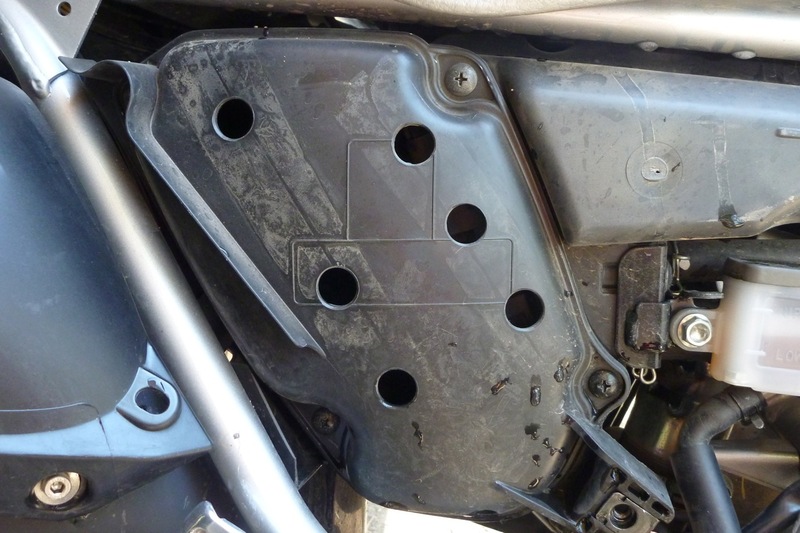 I could have left it at that, but preferred to tape up the non-standard air box holes to preserve the air filter which was already a little grubby, having followed Al on his KLX250 and Christian on his KTM950 along dusty dirt trails for a couple of hours. This of course would require leaning out the EJK programmer which was initially confounding; I’d not come across these ‘black boxes’ before. In fact they are exactly what they claim: an ‘electronic jetting kit’ – just like swapping jets, needle heights and float levels on a carb to get your bike running better following performance mods or as a response to radical altitude variations. 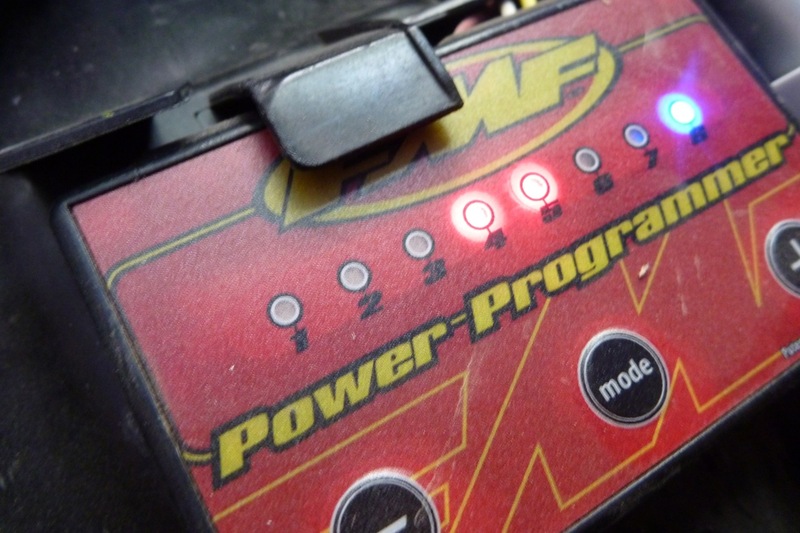 Only now it’s done by simply pressing buttons on a ‘black box’ to tune three fuelling modes: cruising; acceleration and WFO – as well as the rpm ‘switch’ point between those modes. Importantly the EJK (gen. 3) only increases fuel delivery (richens) – it does not lean out the Honda’s original settings which as e all know, for emissions purposes are probably lean enough like most new bikes these days. It took me a while to get my head around modulating the EJK, not wanting to bugger up the settings and end up with the CRF running like a tractor. The online guidelines, videos and users’ versions were a little unclear or contradictory, but once you’re pretty sure what to do, it’s easier than most TV remotes. One source of confusion is the so-called ‘yellow’ light mode (acceleration) which is more orangey-red (picture above left) although red (wide open, max power) is clearly red. 3 cruise, 3 acc, 6 WFO with switching at 5, 4 and 4.5. An email to Dobeck who make EJKs (my red unit is branded ‘FMF’ but is an EJK) came back with a very quick response suggesting: 1.5, 1.5, 2.5 and with the switch points unmodified. So, running at tickover, Light 1 flashes slowly in green; blip the throttle and it flips up to three green lights then down to one or two green lights. Press the Mode button once and you should get three green lights flashing quickly (‘3 cruise’ Stage 1 setting). It means the green mode is live and ready to be modified with the + or – buttons to either side. But as Dobeck admit, the sensitive Mode button can jump to the next ‘orangey-red’ yellow phase. No worries, either scroll through the other 5 modes by pressing Mode until it comes back round to 3 greens flashing. Or do nothing for a few seconds and mode change will deactivate and revert to whatever the settings were. There is nothing to be risked pressing Mode to see what happens or just to establish your settings (mine were indeed set at ‘Stage 1’ as above). Only pressing + or – buttons will modify things. And of course best of all there is no need to plug into a laptop, smart phone or remote programming device; it’s a self-contained programable unit. Once I understood all this I went back to first three green lights flashing in Mode live, and pressed minus until it was flashing green between lights 1 and 2 which equates to 1.5 as Dobeck suggested. Press Mode again and the same setting change for yellow (orangey-red) mode. And then Mode again for the big drop from wide open red (which I rarely use) from 6 to 2.5. As mentioned Dobeck recommended not changing the three switch points so that was it. Once understood it took less than a minute. After cleaning out the dusty air box and greasing the inner surfaces (below left) to catch dust before it got to the element, I taped up the six 1-inch holes on the air box side lid and went for a run. I’m at 5500 feet right now, among hilly backroads and it was a chilly morning, but a short run showed the bike running a little quieter (less induction throb with taped box) while it cruised and accelerated up to 65 as well as ever, if not better. The Dobeck man did say running stock with his suggested settings would improve torque and that was my impression (or it’s what I want). The next few mpgs will tell; I’m expecting it to stay at around 60USmpg (73UK) or above – just what you’d expect from an efi 250. 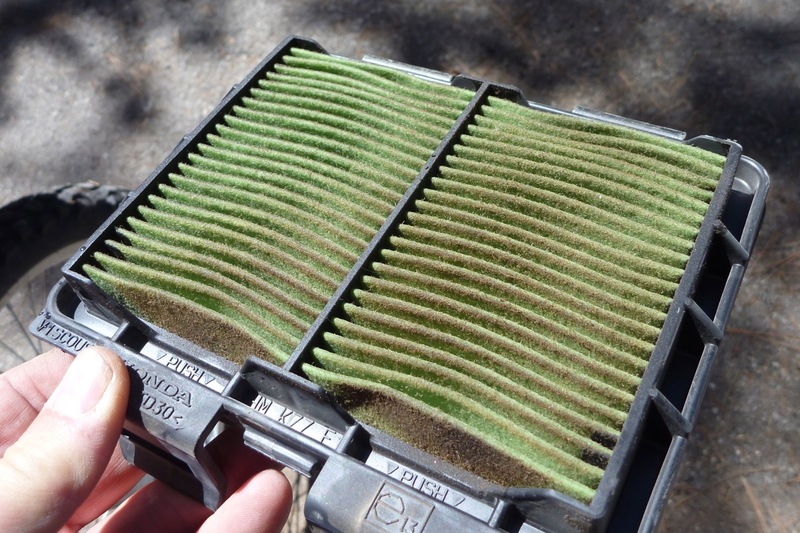 To optimise everything I may even nip over to Reno and buy a new air filter element (but then grind off the restricting spark screen, as most users do). When efi came on the moto scene some complained that meddling with the fuelling was no longer possible. Clever techy types soon came up with aftermarket software to do just that, but the foolproof, self-contained, adjust-on-the-fly EJK black box has got to be the best tuning solution so far. 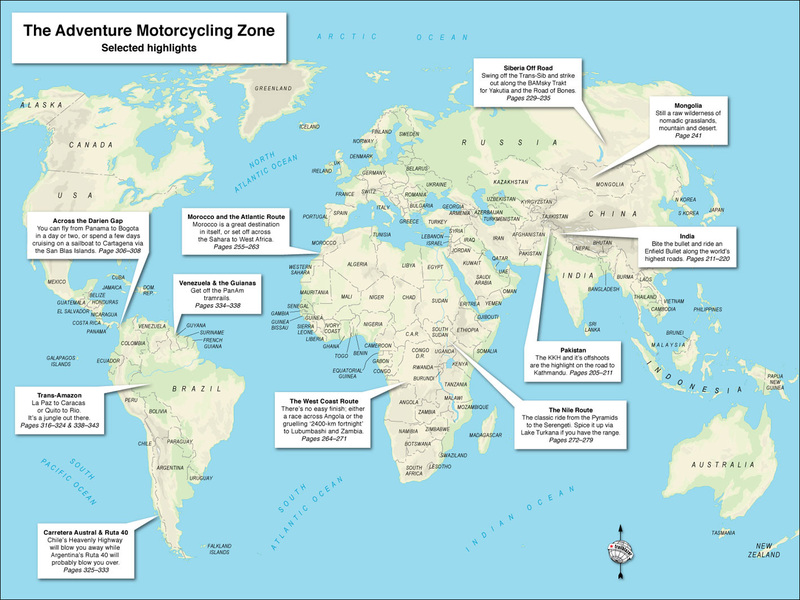 Off course it cannot alter timing to deal with very low octane fuel in the AMZ, but the CRF-L runs a low-compression engine that needs only 86 RON or more. 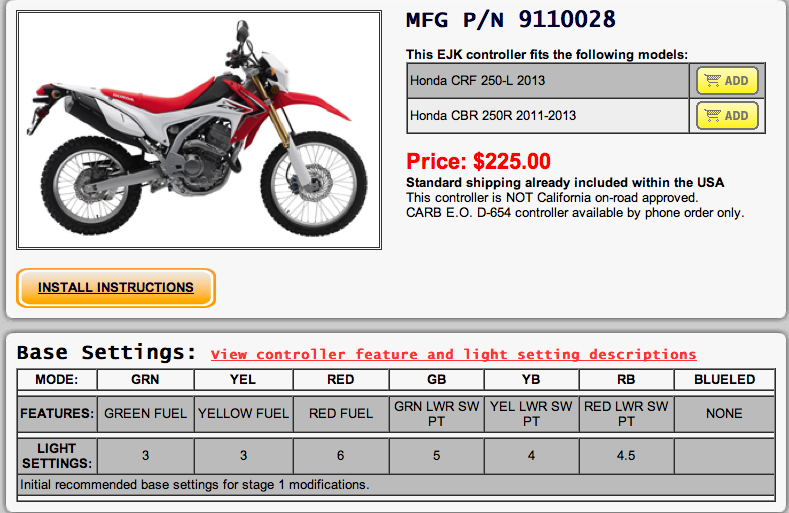 That leaves ECU-generated error codes disabling the bike, but again the Honda seems simple in this respect. Certainly swapping pipes didn’t cause the ECU to flip out and anyway it seems lately that vehicle manufacturers have learned their lesson and ‘limp home’ modes (where present) are only implemented as a last resort. Finally you ask, is the EJK as it is set up now substantially better than the stock bike? Is it worth spending $225 without taking the full Stage 1 route which includes modifications less suited to overland travel? I guess I’d have to ride a stock CRF alongside my current bike to find out but I suspect there’s something in it – perhaps 10% more power with fuel economy barely altered, compensating for the stock super-lean fuelling. If an EJK hadn’t come ready-fitted to my bike I’m not sure I’d have bothered; if I wanted more power I would have bought a bigger bike. But as it is now I’m pleased it’s there and is so easy to retune further down the road. It seems to run about the same as the press bike I tried in February, but as I say I suspect that bike was tuned a little above standard and possibly as result returned fuel consumption a good 20% below what I’d expected. 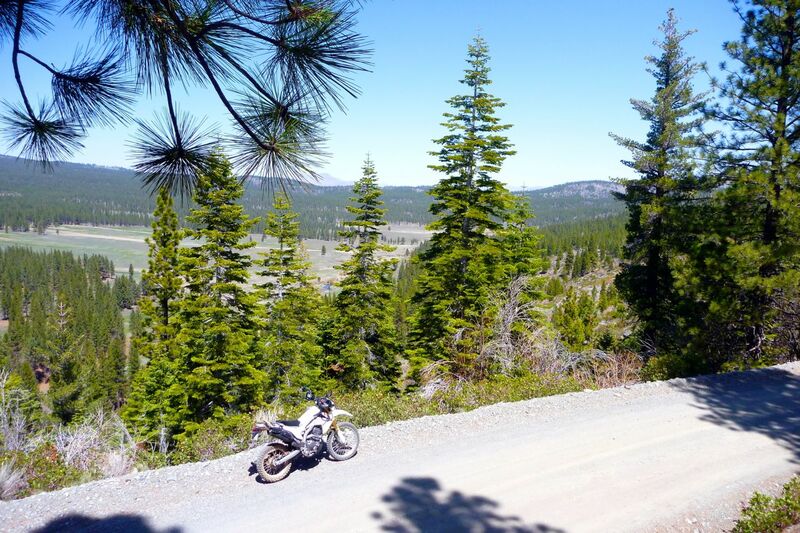 This entry was posted in Adventure Motorcycling Gear Reviews, AMH News, Project Bikes, Project: Honda CRF250L and tagged CRF250L - tuning an EJK fuel controller, Dobeck Performance, EJK fuel controller, Honda CRF250L. Bookmark the permalink. 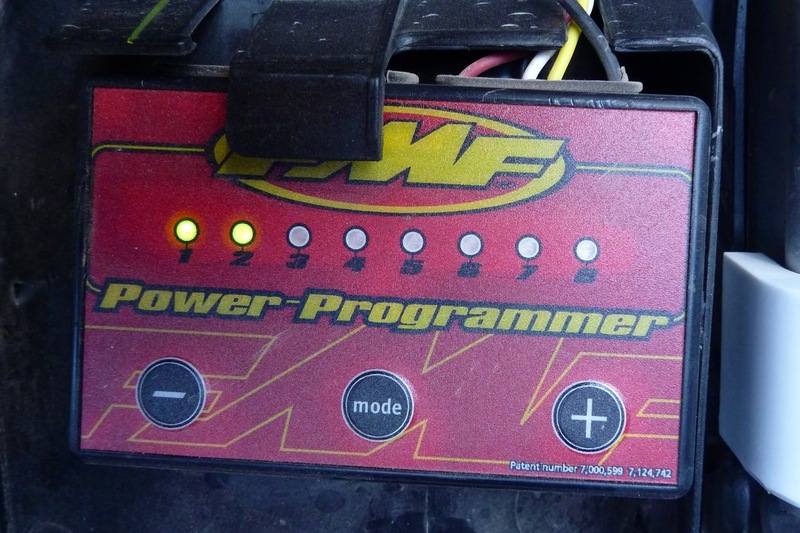 i have crf250l whit fmf programmer and powercore 4 and mega bomb … 3-3-6-5-4-4.5 !? or 4-4-7-3-7-3.5 ? or ? Sorry, don’t know with that set up. Contact EJK – they were very helpful to me. It was great to meet you at Overland, Chris. Thank you for signing my book (and for the DVD). I’ve been looking at the CRF for a while, but since I’m a petite rider, I’m quite inseam challenged. It’s very tough to find a dual sport bike that fits me, so whatever I choose will have to be modified. Is the CRF really ok on highway stretches, when you have to take them? It looks like you’re enjoying your tour of America. I’m looking forward to reading more of your posts. Cheers!